Just when I got my groove back, BAM! Life stepped in and sent me on a detour. The same thing can happen with writing. Several years ago, a new, national fitness magazine bought a series of articles, and a solid editor/writer relationship developed. The paycheck was fantastic, the work, challenging but easy to write. Without warning, the publication shuttered, leaving me scrambling to replace the income I depended on. After landing a contract for a personal essay in a leading magazine, the editor left the publication. The incoming editor placed a hold on all projects until he could sift through what had been scheduled. Unfortunately, my piece was nailed on the chopping block. Fortunately, I still received payment. A hefty envelope fills my mailbox. I'm hoping for an acceptance, but instead, I find a rejection letter. And a form rejection letter, to boot. Sometimes, the detour means we yield, pausing for the chaotic pace to slow before providing a valuable lesson that teaches us how to adapt to this crazy world in which we work, thrive, play, enjoy, and write. And all the time, confronting an obstacle head-on makes us a stronger force to be reckoned with. 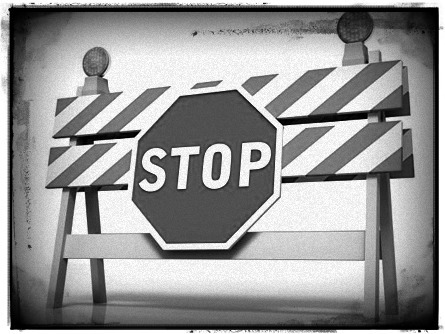 How do you make the most of a writing roadblock? Compromise. You're thinking 3000-word feature. The editor is thinking a 275-word FOB piece. Maybe this is your chance to break into a new market, maybe this is a stepping stone for bigger and better ideas to be accepted by an editor. Sure, you may not want to give up on a feature, but compromising and accepting an offer will leave a solid impression with an editor. This scenario happened to me. After an editor rejected my feature pitch, she proposed I narrow the focus and submit the piece as an FOB. I accepted. Cha-ching! Persist. When rejection knocks on the door, stepping away from its grip can be tough, but do not let it create unnecessary drama. Rejection is part of life; how you handle the situation will make a huge difference. Persistence will spur you and your writing in a positive direction. After discussing story ideas with an editor, she rejected three possible pieces before hitting on the fourth and final idea. Realize. Trust me. This (rejection) isn't about you. Do not take rejection personally. It's about not fitting with a publication at this particular moment in time. Try, try again. I'm still pitching a story to an editor - always with a bit of a different angle. Persevere. If an agent/editor rejects your work, send it somewhere else. Now. Do it! You'll pat yourself on the back later, when you connect with an editor. Learn. Listen. Take constructive feedback, internalize it, and learn from the examples mentioned above. Do not let negativity cause a pileup! Instead, tap the breaks and slow down so you will gain an understanding of what will (or won't) work. A roadblock doesn't mean the end of the road. It means negotiating change, adapting to a new route of writing. And each of these elements will make your writing stronger. I think it was a group called Chumbawumba who sang a song that had the line, "I get knocked down, but I get up again, 'cause you're never gonna keep me down." Yes, as writers we have to be like those huge inflatable "toys" I grew up with. They wobble, they dip down, but they immediately right themselves and instantly are standing up, tall, once again. Thanks for the much-needed reminder, LuAnn. I just got a "no" this morning, but it was an encouraging no. However, despite the positive comments that accompanied the rejection, it still stings a bit. So thanks. Sioux - Thanks. I don't hear 'no' very often, but when I do receive a "no thank you" from an editor, I keep going. Sure, I could give up, but what fun would that be?